As the Warbird decloaks off your starboard bow, you brace for the final impact. The bridge viewscreen appears miles away, floating in a blinking Red Alert haze. You look around the bridge at your crew, all working intently at their stations. This was supposed to be a routine patrol, you remind yourself. This wasn't supposed to happen. You manage to rise to your feet just as the third torpedo broadsides your ship, throwing you to the deck once again. "They've targeted Main Engineering, Captain! Extensive damage to decks eight through fourteen. Forward shields at eleven percent and falling." You stare grimly at the viewscreen as the Warbird vanishes. Soon, it will reappear, probably for the last time. You struggle into your chair under the expectant gazes of your bridge crew. As you lean forward to give the final word, a slight smile begins to play at the edges of your mouth. Welcome to a grand adventure! If you're reading this welcome message, you probably fall into one of two categories — either you're a Star Trek fan who's curious about this whole "roleplaying" thing, or you're a game fan who's been wanting to find a quality Star Trek game. Either way, Star Trek: Vanguard is the place for you. If you're a Star Trek fan who's new to roleplaying games, prepare to experience your favorite universe in a new and exciting ways. Ever wonder what it would be like to command your own starship? To lead Away Teams on remote and mysterious worlds? If you're a gamer who's been waiting for a quality game, we hope you come join us and experience a new world. 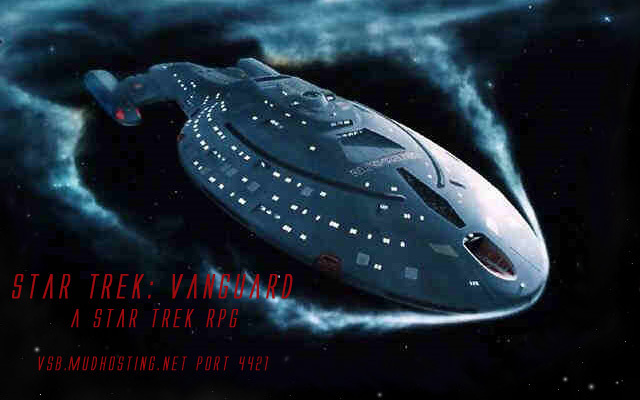 Star Trek: Vanguard is non-canon a Star Trek MUSH that is set on board the USS Vanguard (NCC-76393). We are a single ship game, which means that we do not have a coded space system and the entire game takes place on a single vessel. All players who join us will become a part of the crew of the starship. There are a total of 160 pages on this wiki. The last update to this wiki occurred 08 Jul 2017 18:47.